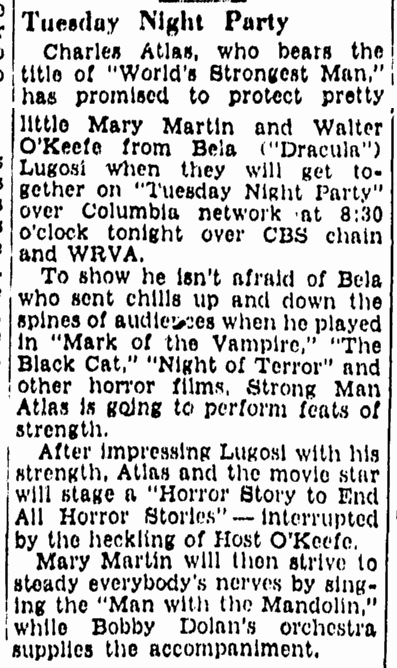 Charles Atlas, “World’s Strongest Man,” and Bela Lugosi will be heard with Walter O’Keefe over the WABC-Columbia network tonight. There was no doubt about it. Someone was in Room 3601. There were noises such as might be made by a body being dragged across the floor. There were thuds now and again, and occasionally a weird sound like a moan. Yet nobody came to answer the door buzzer. This time the door of Room 3601 was ajar. No one was in view, so we walked into the living room. Suddenly from the bedroom came scream that was as suddenly cutoff and followed by a burst of hellish laughter. Bela Lugosi stood in the doorway, a boyish grin spreading over his dark face, a bottle of sulphur water in his hand. It was quite early in the morning and Mr. Lugosi had on a bright red robe over his pajamas. He drinks imported mineral water so heavy with sulphur that it expands the walls when a bottle is opened. Translated from the Hungarian, this last sentence means that Mr. Lugosi is here for a guest shot with Walter O’Keefe at CBS tonight, when we will play a werewolf with a terrible case of rabies. In Hollywood, Mr. Lugosi recently finished a role in “Ninotchka” with Greta Garbo. It was the first traffic he ever had with the glamorous Swede and he’s all for her. He’s the kind of fellow who, if he didn’t like her, would say so in spades. Mr. Lugosi has gone through some trying times during the last few years. He confesses that the economic horrors almost got him down. The days of defeat were bitter, because they followed on a period of fine prosperity. Then one day the owner of a small Hollywood theater, facing bankruptcy, started reviving old horror pictures. He brought in “Dracula” and it ran for five weeks. “One day,” said Lugosi, “I drive past and see my name, and big lines, people all around. I wonder what he is giving away to the people—maybe bacon or vegetables. But it is the comeback of horror, and I come back. Doesn’t he ever get tired of being typed as a horror-man? The other afternoon during a Walter O’keefe rehearsal, one of the actors let loose with a scream that almost shattered the microphones. The entire cast just glanced up and went on with their business, that is, the entire cast with one exception. The exception took almost ten minutes to recover from the scare and shock. His name is Bela Lugosi, the horror man of the screen.